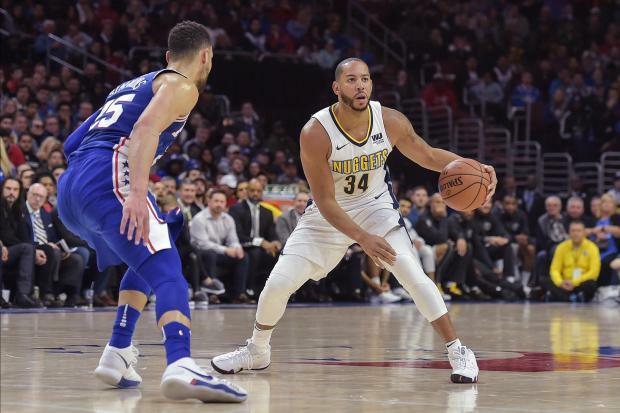 Outscoring the visiting Denver Nuggets 34-15 in the third quarter, the Philadelphia 76ers moved a step closer to locking down home-court advantage for the first round of the NBA playoffs with a 123-104 win Monday night. Seven players scored in double figures for the 76ers, who remain the fourth seed in the Eastern Conference, a half-game ahead of the Indiana Pacers. Dario Saric led the way with 20 points while Joel Embiid contributed 20 points and 13 rebounds despite foul trouble. Sixers rookie Markelle Fultz, the No. 1 overall pick in last June's NBA draft, returned from a five-month absence due to a shoulder injury and finished with 10 points and eight assists in 14 minutes. Jayson Tatum scored 23 points and Marcus Morris had 20 against his former team before leaving with an injury as Boston won at Phoenix. Al Horford added 19 points, nine rebounds and seven assists for the Celtics, who picked up their fourth straight win. Morris sustained a right ankle injury in the second half and did not return. X-rays on Morris' ankle came back negative, the team announced. Josh Jackson had 23 points, Tyler Ulis had 19 points and eight assists and Troy Daniels scored 18 as Phoenix took its 12th straight defeat and lost for the 22nd time in 23 games. Wayne Selden canned four 3-pointers and scored 23 points as Memphis defeated Minnesota in Minneapolis. Marc Gasol added 20 points, including a pair of foul shots with 14.5 seconds left to up the lead to six, and also grabbed 10 rebounds for a double-double. Jeff Teague notched a game-high 25 points and seven assists for Minnesota, which managed just 11 points in the fourth quarter. Andrew Wiggins and Taj Gibson each finished with 18 points, while Karl-Anthony Towns contributed 15 points, 12 rebounds and six assists. Kemba Walker had 31 points, including 11 in overtime, and Dwight Howard added 23 points to lead Charlotte over visiting New York. Walker had three 3-pointers in the extra frame as the Hornets outscored New York 20-11 to win their fourth consecutive game. Trey Burke scored 42 points and Michael Beasley had 27 to lead the Knicks, who lost for the third time in four games. Reggie Jackson led a balanced attack with 20 points, and host Detroit won for the fourth time in five games by topping Los Angeles. Jackson, playing just his fourth game since recovering from a severe ankle sprain, added five rebounds and three assists. Reggie Bullock scored 16 points and Andre Drummond had 15 points and 18 rebounds for Detroit, which retains slim playoff hopes. Julius Randle paced the Lakers with 23 points and 11 rebounds. Kyle Kuzma contributed 20 points and 11 rebounds, and fellow rookie Lonzo Ball posted 15 points, eight rebounds and 11 assists.